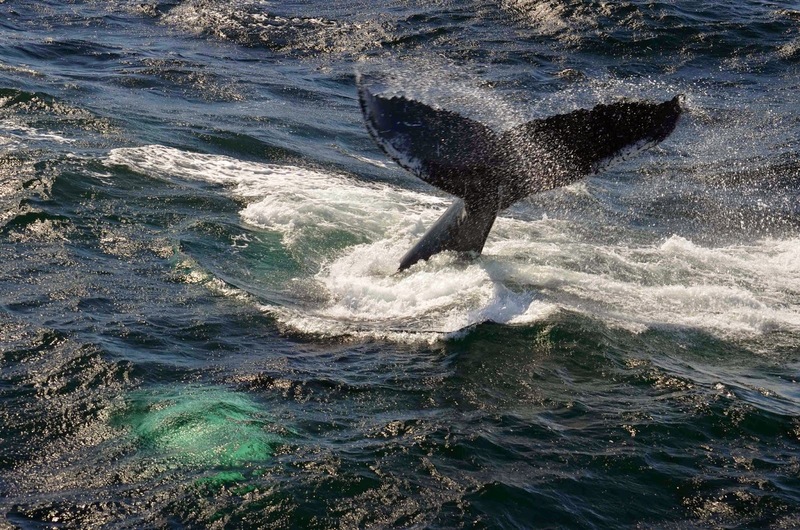 We had a spectacular whale watch this afternoon aboard the Aurora! On the southern end of the bank, we came across an insane feeding frenzy. Scattered across the area, there were a number of distinct feeding groups which were made obvious by large congregations of birds and white splashing at the water’s surface. 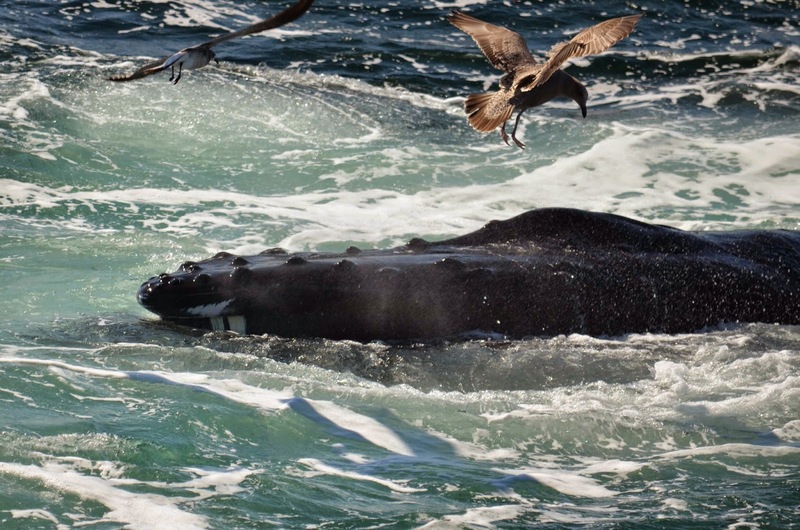 These groups were not made up of just whales but rather all different types of animals feeding together. 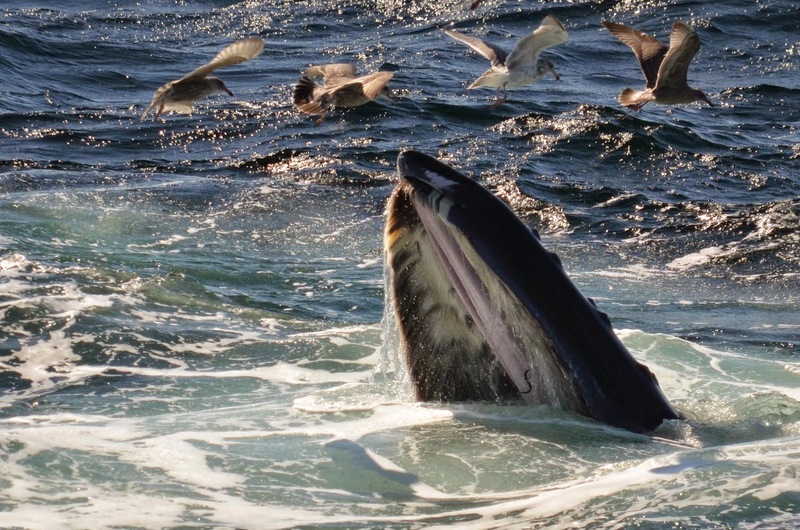 From what we could tell, these animals included many different bird species, bluefin tuna, humpbacks, dolphins and even a fin whale! Sand lance were of course the target fish and there were plenty to go around. I have never seen so many different animals feeding on one bait ball. 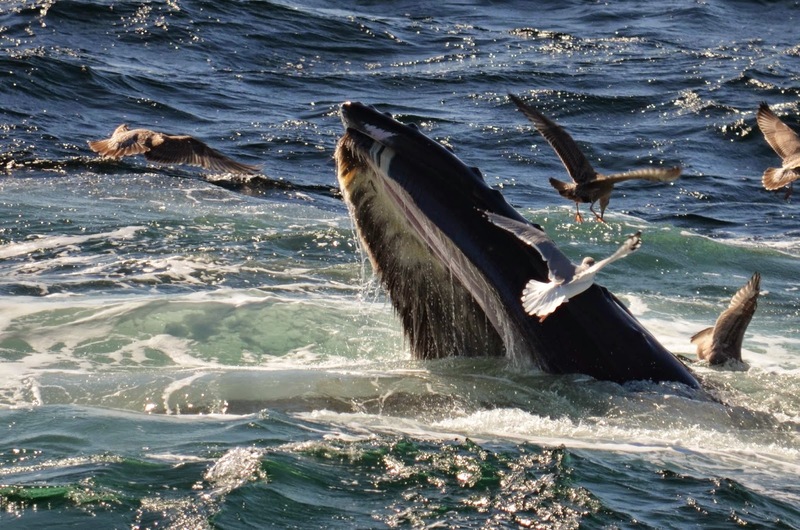 As far as whales go, there were about fifteen humpbacks spread out across the area. Most of these whales were either solo or in groups of two. We first spent some time with Midnight and her calf who were bubble net feeding! It was unclear whether this calf was participating or just along for the ride. 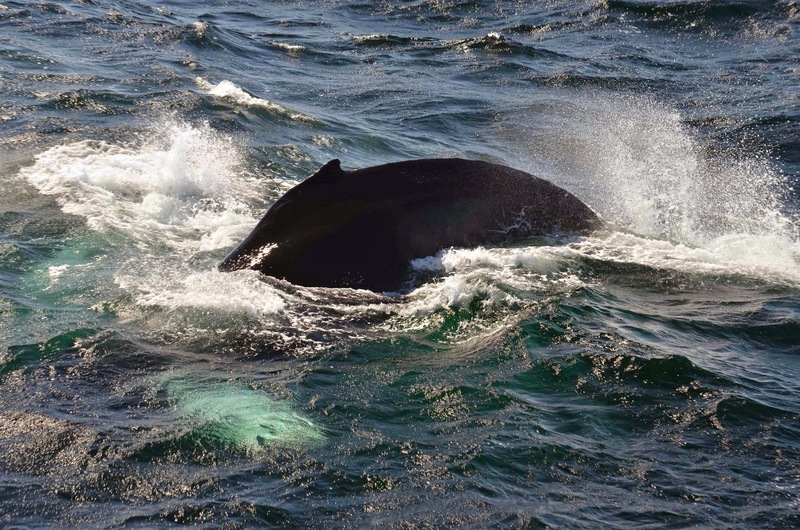 These coming days will be the last the calf will spend with its mom before they separate and make their way back down to the breeding grounds for the winter. We then went on to Sundown who was displaying really exciting kick-feeding behavior! Since every humpback has their own sort of style of kick-feeding, it’s always really cool to see a new whale kick-feed for the first time and learn how they do things. Sundown uses a single, high-raised and swift kick to the surface in one fluid motion before diving in a loop, blowing bubbles and surfacing with a large open mouth (see photo)! Check out those sand lance trying to escape! One is even stuck in her baleen. Looks like someone needs to floss! We got to watch her as she repeatedly exhibited this fascinating feeding behavior right next to the boat! We then moved on to two old-timers, Salt and Colt, who were bubble-net feeding together along with a slew of other aforementioned animals. You could tell that this was not Salt and Colt’s first rodeo. This duo seemed to follow the tuna hopping from bait ball to bait ball as the hoard of animals repeatedly conquered various schools of sand lance. Towards the end of the whale watch, we also spotted two solo calves who may have just separated from their mothers. One of these young whales was Milkweed’s calf whom we saw with his mother earlier this week. It’s possible that his mother was nearby, but we did not spot her. The second calf we saw only from afar and could not recognize. Finally, the bird activity out on the bank today was absolutely incredible! 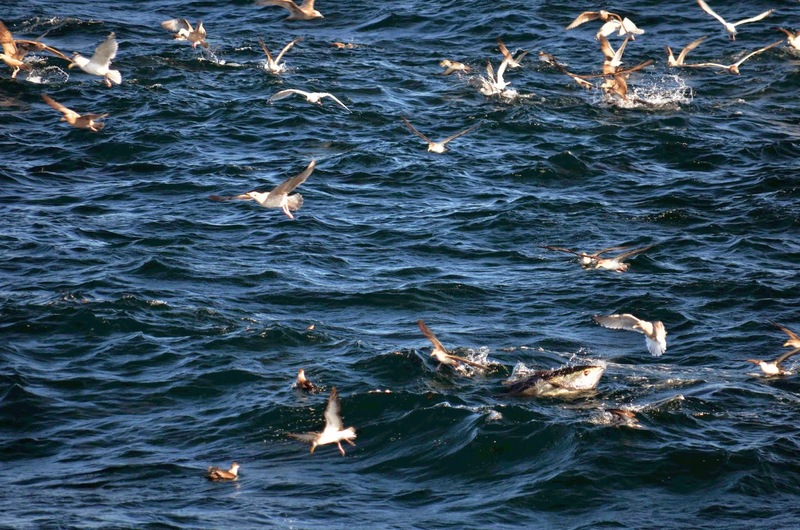 We saw thousands of birds including northern gannets, lots of different species of gulls, Cory’s and great shearwaters. Hopefully this exciting activity will continue through the late fall!